We watch it on the tele on a Thursday night, the Europa League. 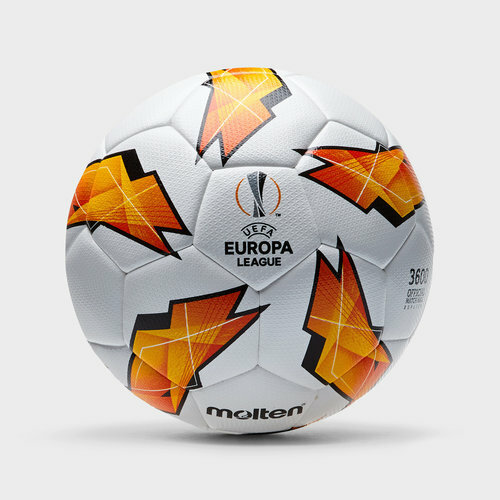 Train and play like your favourite stars who qualify with their team based on their national league standings using this Molten UEFA Europa League 18/19 3600 Training Football in a White and Orange colourway. This is the best Molten ball available for those of you who wish not to choose and use the official match ball. This ball has a triangular raised textured surface for greater control and aerodynamics through the air. The construction of this ball uses the very best of a hybrid bonded and machine stitched technique. This ensures there is no water absorption and maintains the weight of the ball to a constant level, even in wet conditions. This ball is available in a size 5.